Job security offered by the employer has changed. The future of work and the job market suggest a world of free agency, with corporations bidding on the best available talent. And landing a job no longer translates to a stable work environment, nor does it guarantee a good fit. My uncle shared with me, “You are only as secure as the whim of your immediate supervisor.” The implication is you better have a good boss, someone who believes in you. Your boss who likes you leaves for greener pastures, thus taking away your endorsement, leaving you vulnerable. The organization is acquired by a competitor and your role is a duplicate within the parent company. After countless interviews and being chosen for the role, you realize quickly it is not a good fit. Technology trends like blockchain or AI require new skillsets, especially in your area of the business. My mantra is “Adapt or die.” An urgent call to action for people on the fence about their work futures. In the Age of Career Agility, our knack for responding to change is what allows our careers to survive – and flourish. (Yes, very Darwin-esque.) Those who pay attention and adjust their strategies and points of view to tackle changing conditions will win. Recently I was on a whitewater rafting trip, where the conditions of the river changed around every turn. 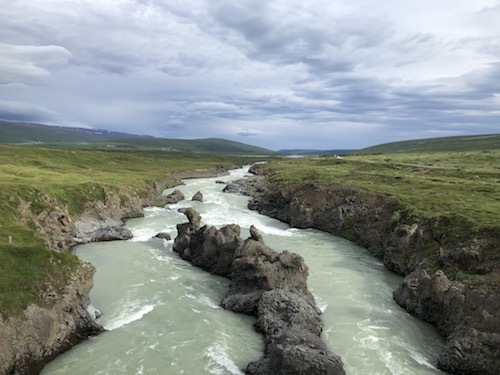 In order to prevent a fall into the glacier waters (although not entirely preventable), it was important to paddle forward/backward at certain parts of the rapids. Responding to the changing conditions ensured a safe and enjoyable trip. With the river as the metaphor for the often unpredictable workplace, you can anticipate and manage what’s ahead. Before the employer-employee loyalty equation changed. Gone are the days of one or two employers throughout our lives and receiving the proverbial watch at the end of a 40-year career. The median employee tenure is the length of time a worker has been with his or her current employer. It has dropped to 4.2 years, according to the Bureau of Labor Statistics. What’s more, 76% of full-time workers, while not actively looking for a new job, would leave their current workplace if the right opportunity came along, according to CareerBuilder. Job security is indeed a myth. The traditional or linear career path has vanished and the system as we knew it no longer exists. Yesterday’s career management rules are obsolete. The insecure job market however, can be tamed with smart thinking. Start with a mindset more consistent with change, and reflective of a dynamic workplace. Similar to the phrase “home is where you make it,” the secure mindset rests within the individual. Like the river ride mentioned earlier, we can own our career path by gaining self-awareness, responding to change, and taking action. 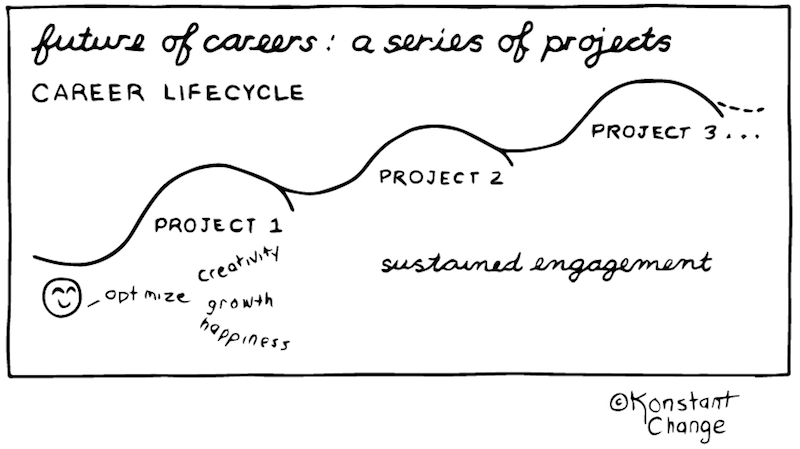 Viewing your career as a series of projects, rather than a long horizon, will heighten engagement and the satisfaction of attaining a goal. Productivity and passion are commonplace at the beginning of a new job or at the start of a new project. This motivated behavior leads to positive outcomes and management satisfaction. Employers and employees benefit. You can do this by crafting projects within your current role in the short term, or grow into distinctly different jobs over time. The constant waves of technology promise efficiency, but also threaten to eliminate jobs. Yet, when the jobs of one economy are replaced by another (like agrarian, industrial, knowledge, etc. ), AI, blockchain, data, and technology developments are busily creating the jobs of the future. What are you better at than anyone else in your organization? You may have many skills and interests, yet if you become known for one thing, people will remember you. When Melissa G. Wilson published her first few books, she was interested in several topics: networking, alliance partnerships, and career development. Her curiosity helped her to become expert in a number of areas. The co-author of one of the books advised her to “pick one.” Melissa chose the topic of networking and invented the word Networlding 20 years ago. Her chosen topic is now the name of her publishing and consulting company. As a work in progress with abundant aspiration, I choose career agility, a springboard for all things agile. I want people to remember me for this one word above all others. In my book, Activate Your Agile Career: How Responding to Change Will Inspire Your Life’s Work, I frame the factors of the career agility based on proactive steps – not reactive measures. Stay agile, stay relevant, subscribe to Marti’s 52 Ideas. Fore more details on career agility, check it out here.